Facial Enhancement can be accomplished with a filler or an implant. Fillers (Restylane®, Perlane®, Juvederm®, Radiesse®) are by far, the most common means of providing enhanced fullness. They provide almost instant results, with minimal recovery. With fillers, results need to be maintained with periodic treatments. Implants, on the other hand, require a recovery period, but can provide long lasting enhancement. Chin Implants are the most frequently used facial implants. Over 11,000 chin implants were inserted last year alone. The implant shape, size and material can be varied to help achieve the desired result. Even chin implants with clefts are available. The chin implant may be inserted through a small incision under the chin or inside the mouth. The woman above presented with a desire for a stronger chin. 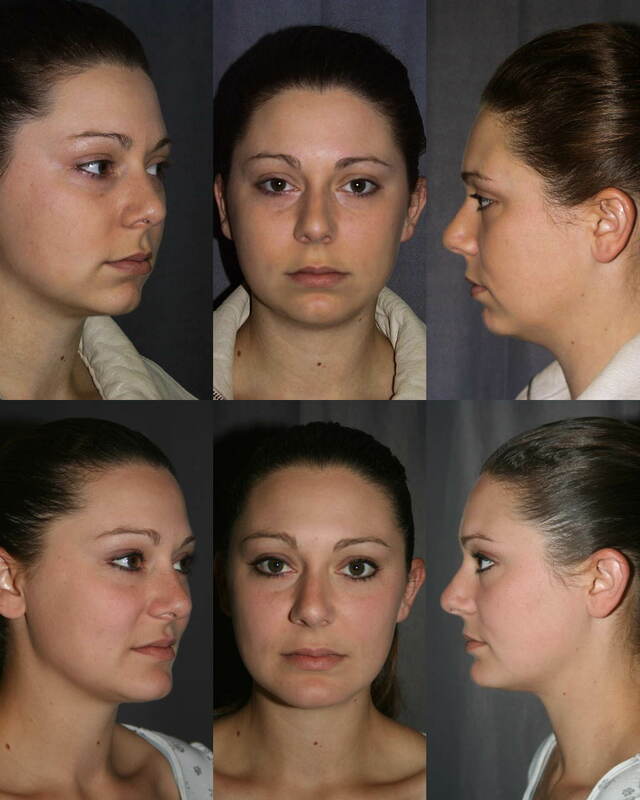 The before pictures (top row) show that the most prominent aspect of her chin is well behind her lips. This relationship is most often seen in children. In an adult, the weak chin is not necessarily youthful, instead it gives a meek or timid look. Before surgery, the jaw line is also not well defined. After Chin Augmentation (bottom row), the chin implant moves the chin profile anterior, and in line with the lip prominences. A strong jaw, with a well defined jawline is the result. More youthful appearance, and a more beautiful balance between the middle and lower face is the result. How Much Chin is Enough? On the profile view, the ideal chin extends as far forward as the lips. When the chin is shorter than the lips, this is called Microgenia; literally “small chin” in latin. Computer imaging can help decide how much chin augmentation is enough. A digital photo of your profile can be modified to provide just the right amount of chin augmentation. This is used to guide implant selection, and helps provide you with a predictable result. To find out is if chin augmentation is right for you, schedule a consultation appointment today. Give me a call at (925) 943-6353.